I've posted this bit on most December 31sts since 2008, and I'm doing it again. I don't have any other year-enders, so this will have to do, on ending the year on the dot. In closing out my first year of blogging, I'd like to take an incidental look at one of our language's most important fragments. Like Mr. Eliot's observations of Baudelaire being a fragmentary Dante, and like the brilliantly arranged frammenti of Piranesi, the great bits of our communication processes owe a breathy thanks to the lowly period. A dot. A point. It separates to provide analysis and coherent recognition of thought. A simple dot (.). But dots are as little or as big as you need: there's "Little Dot" (the cartoon character of Harvey Comics, created 1947, who was fascinated bylines and dots and dashes), "Admiral Dot", polka dots, Mama Dots. Dots get considerably ratcheted up in quantum dots, and then expanded beyond that with the idea of the dot as an abbreviation for the multiplication sign, both of which increase things rather than bringing them to an end, a conclusion. The dot used after a musical note delineates that there is an increase in time by half, which would be an interesting notation to adopt in literature, if we were somehow able to magnify and increase that which would normally have been ended by the same notation. That's quite a bit of expansion from a word that starts out life in Middle English as the definer of the head of a boil. But this year will end in about 50 minutes from now, and I wll be able to put the final keystroke to the final sentence to my final post of the year, and put it all to sleep. And the year will end, at 11:59:59. On the dot. Earlier in this blog I wrote a bit called "Dreaming of the 10-Ton Eiffel Tower Bullet, 1891" which was about the massive free-fall bullet ride that was to be part of an Eiffel Tower entertainment package--the apparatus wasn't built, which was probably a good thing, what with dropping 20 people in a steel bullet from 900' feet not being such a brilliant idea1. The Eiffel Tower had been built a few years before for the 1889 world's fair in Paris to mixed reviews--actually there was a call for its deconstruction post-fair because so many people found it so confounding/unappealing. The Columbian Expo's greatest "response" to the Eiffel Tower and the not-building-another-one was probably the 264' Ferris wheel--it was very popular, and after the fair it was dismantled and moved to another location in Chicago in 1895, and then disassembled again and moved for use in the St. Louis World's Fair of 1904--after that it was ingloriously retired and sold for scrap (for $1800). This all came up just now because in browsing the 1892 volume of Scientific American I bumped into this drawing of a proposed exhibit/attraction for Chicago--an observation tower with a "slide". Folks would be hauled up to the deck at the top, after which they would be loaded onto a car (descent controlled by air brakes) and sent back down on a 5o grade. There's no help in the article or drawing to determine just how massive this structure was supposed to be, though it looks very substantial, hundreds of feet tall. Given that the new form of building at this time was the skyscraper and that the only thing to make the skyscraper practicable was an elevator, this was probably a good advertisement/display/p.r. stunt for the machine--even more so for the brakes on the sledges and the elevator, because you really can't have tall buildings without elevators, and you can't have elevators without good brakes. It was an amusing to find these designs using square elements in the design of advertisements--interesting and odd, mainly because I hadn't seen much like this, before. And here were three examples ina single issue of Illustrirte Zeitung for June 1923. It seemed as though the idea might be endemic--as it turned out, there were no other examples for the use of squares like these for any other advertisers for the rest of the year. In any event, the square details are an attractive thing. I think I've never seen a display quite like this one, before. 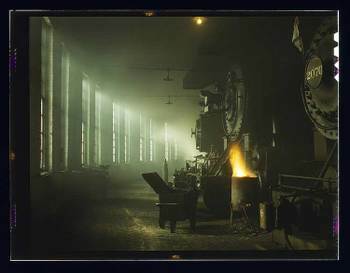 I've admired this image for quite some time, finding it in the Library of Congress' collection of the Historical Section of the Farm Security Administration (FSA) color photographs. It is anonymous, unfortunately, but since there were really only 23 or so staff photographers for this gigantic undertaking (including Esther Bubley, Marjory Collins, Mary Post Wolcott, Arthur Rothstein, Walker Evans, Russell Lee, Jack Delano, Gordon Parks, Charlotte Brooks, John Vachon, Carl Mydans, Dorothea Lange, and Ben Shahn, ten of which are truly monumental names in the history of 20th century American photography) I think that we could guess that it was done by the hands of a master. It seems as though less than 2% of the 163,000 or so photographs made by this section during its eight-year run (1937-1945) were made in color, and I'm glad that this was one of them. This very graphic allegorical map was published at the beginning of the Civil War in 1861 and was intended to depict General Winfield Scott's not-bad plan for the eventual destruction of the Confederacy. He called for isolating the Southern states by a naval blockade and by a push from the West and also an advance up the Mississippi River. The problem with the plan for most people was that Scott saw correctly that the new war was going to be long and costly--this at a time when most saw the conflict as a months-long affair. Part of the correctness of Scott's recognition of a long war was that the Northern states had fewer than 20,000 troops, and that many more would be needed and that the army would need to be gathered, trained, and built, none of which would happen quickly. But the general faults with the plan do not diminish his important contribution that the Civil War would a total war, and that the conflict would not be over any time soon. Such is the nature of the small but desperate urgencies that they come at large and ultra-desperate times, actions required of impossible and uneven urgence, responses vaulted into the black hole of needless authority. Or some such. That is the way some of these images looked to me, removed from their context, taking away their stories and supplying one's own. Urgently. This post is related in a way to this blog's series on using a "paper microscope" to find semi-hidden human geographies in old prints--where there are scenes of low drama taking place in the tiny incidental detail of some architectural rendering of some sort. In this case, though, the story is the main image, though the original story has simply been removed. So, our urgencies (top to bottom): the expression of urgent staying-in-bed, despite entreaties and an advancing army; urgent sleeping to ward off an advancing lion, horse, and highwaymen; terrifically urgent sitting, even when being upended and beaten with sticks to make the sitting stop; and, finally, urgent suicide (with backup sword at the ready) to evade capture of an advancing army. The end. Image source: Theatre Historique (I believe), Amsterdam, ca. 1700-1710, published by Pieter van der Aa. "Next to forums I must speak of the baths as places of public resort. At the end of the third century after Christ, Rome numbered 11 large public thermae, and 926 smaller ones conducted under private enterprise. The baths of Caracalla alone could accommodate, at one time, 1,600 people; the baths of Diocletian, 3,600. Taking 1,500 as the average accommodation of each of the public thermae, and 50 as that of each of the private baths, we learn that in ancient Rome, at any minute, 62,800 citizens could restore their strength in baths of every nature and description; and this, without bringing into the calculation the Tiber, the Anio, the Lake of Agrippa, and the bathing accommodations with which every Roman house was abundantly furnished..."
This orderly and semi-pastoral bird's-eye view of the earliest part of the war in the west of WWII appeared in The Illustrated London News on September 30, 1939, three weeks or so after the Nazi attack on Poland. The foreground shows about 40 km of the front from the river Nied to the Saar and south to Saarburgken, with the Siegfried Line in the distance. The map shows the region into which 40 French divisions advanced from September 7-16, meeting little resistance from the outnumbered German troops who by and large fell back to more defensible positions. This period of the war has often been referred to as the "Phony War" due to the lack of action, though it wouldn't seem so "phony" if you were killed in the process, as thousands were. Winston Churchill referred to it more as the "Twilight War", which is far more appropriate--and this no doubt more meaningful to Churchill int he light of the HMS aircraft carrier "Courageous" being sent to the bottom by Nazi torpedoes with the loss of more than 500 sailors...there was certainly not a bloody thing "phony" in that. The French referred to this period as the "Drole de Guerre", which they really shouldn't've done--their Saar offensive of mid-September being stunted and odd, came to a halt, and the troops called back to the doomed Maginot in October. The Twilight War continued until late April, and then in May, it was certainly all over, as the Nazis attacked Belgium, Luxembourg, and the Netherlands. And then of course came France. In just about the same amount of time that the Saar Offensive occupied, the Germany advanced and forced France to surrender, the curtain coming down on June 22. Calm before the storm, and all that--the rest of the war was more storm before the storm, until there was storm no more. Thomas Edison's November 1879 patent on the incandescent light bulb is generally take as being the first great step into the modern age of electric lighting, this following decades of other groundbreaking research by a dozen others in the field. And so electric was popularly brought to the popular world, though it existed elsewhere decades earlier--for example, in lighthouses, where the first electric arc lamp was used beginning in 1858. By the time this image (below) appeared in The Engineer in 1887, there were nearly thirty years of improvements to the electric light house--and the cross section of the lamp at the Isle of May from this issue proves to be a particularly beautiful example of art-in-engineering. The first lighthouse on this remote piece of land off the coast of Scotland appeared about 200 years earlier--a coal-fired light. This one, built beginning in 1885, would be extraordinarily powerful, achieving as much as 6-million candlepower. It is self-published, and tiny, and bound in a red cloth that surprisingly has the title stamped on its spine. The title begs attention, and then the text begs comprehension--and that's okay, as this is someone's proud work, and it is entirely possible that I have missed the object of the experience. That said, the construction, illustration, literary undertaking, and poetical wanderings are occasionally extremely surprising--and if "surprise" and revealing an insight that you'd never have had on your own is the point of writing, then I'd have to say that this experiment was successful. The author notes with no pomp and no modesty that his is the "greatest scope ever attempted in a work on paper". And what he meant was at least on little paper, because this book measures 3.5x2.5 inches, and one quarter of that is set aside for ample margins which flesh the work out to 88 pages. The title and subtitle are mysterious, as with everything else--even the final parenthetic note at the bottom of what is actually the title page ("half-title page") gets an eyebrow-raise. But as the author says, this is "experimental literature", and perhaps judgment of this work should be unresolved, as the experiment might still be underway. There were many more war-related illustrations in these few dozen pages, with these three having the most appeal and greatest impact--pretty good stuff spread out over just two or so square yards of magazine pages. In the early days of aviation aerial assault must have seemed incredible--and an abomination. Hurling stones and other offensive weapons by trebuchet and catapult is one thing, and launching balls and shot from cannons and mortars is quite another--but actually having your weapon flown over an enemy's position and dropped, remotely or via cable, must have been ab excruciating achievement, militarily speaking. To be able to direct an explosive charge over a position not reachable by an infantry (say in 1915) must've been a short-lived comfort on the offensive end, though the user of such a technology would also have to contend with the contrary, as the enemy would be able to do the same thing themselves. This idea was not limited to just military purposes. Companies could now wage an advertising war war against competitors in a thee-sky's-the-limit campaign, hoisting their ads on balloons anchored over a city, making it possible for the first time to have your message so universally read, a pre-intertubes version of smoke signals. And this, seeming more on the Orwellian/1984 side, or perhaps more contemporary as an instrument of the Dear Leader in North Korea (left, from Popular Mechanics, July, 1939).